Earl Kemp Long (1895-1960) was the political heir to his brother Huey in Louisiana politics. A country boy who never lost his common touch, he ran for office in every state election between 1933 and 1959. He was the best campaigning politician Louisiana ever produced. In his final term as governor, he suffered a breakdown on live television while addressing members of the legislature. He was kidnapped and committed to mental institutions in Texas and Louisiana. That he engineered his own release gives proof that he was in charge of his faculties. Abandoned by his family and his allies, Long was written off politically. But in 1960, Earl had other ideas. He was plotting his comeback. In poor health, smoking and drinking, Earl decided to challenge the incumbent in Louisiana’s Eighth Congressional District, Harold McSween. Doctors warned him that the race could cost him his life. But politics was his life and he vowed to win the election or die trying. He did both. This book tells the story of the last year of Long’s life and the campaign that he waged and won by sheer force of will. He won the election (and a sizable bet he placed on it) but was dead in just over a week. 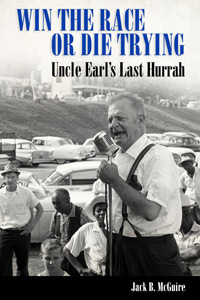 Win the Race or Die Trying captures the essence of Earl Long by chronicling the desperate, death-defying campaign he waged to redefine his legacy. WRBH’s Crescent City Chronicles program airs every Saturday at 5PM with a replay on Sunday at 3AM and Tuesday at 3AM.